Faculty members Teresa Przybylski and Shawn Kerwin met with Eric Armstrong to record an audio interview about their design work for The Stratford Festival‘s 2017 season. Kerwin is designing Euripides’ The Bakkhai, directed by York alumna Jillian Keiley, while Przybylski is designing The Madwoman of Chaillot, by French playwright Jean Giraudoux, directed by Donna Feore. Both plays are being staged in the Tom Patterson Theatre, but each play has its own special requirements. 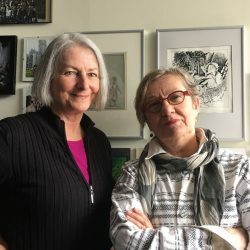 With the shows opening at very different times in the Stratford Festival season, the two designers were at very different points in their creative process.